It is becoming clear that US influence – despite its “pivot toward Asia” – is waning across the Asia Pacific region. Washington has suffered geopolitical setbacks in virtually every nation in Asia Pacific, including those now led by regimes it has meticulously organized, funded, and backed for decades. It is also waning, however, among those nations considered long-time and crucial US allies. This includes Southeast Asia’s Thailand, whom the US repeatedly reminds the world has been Washington’s ally since the Cold War and America’s war in Vietnam, and allegedly, even before that. However, in reality, Thailand has incrementally dismantled American influence over it, and has diversified its trade and cooperation with a large variety of nations – including China – as a means of depending on ties with no single nation in particular. Thailand’s economic trade is focused primarily within Asia, with the majority of its imports and exports divided equally between China, Japan, and ASEAN, with the West collectively representing a smaller – though not insignificant – market. It is no coincidence that Thailand’s geopolitical ties thus reflect its economic ties around the world – revealing that economic and sociopolitical realities are driving intentional relations regardless of the vast array of “soft power” means at Washington’s disposal. A look at Thailand’s military inventories reveals a similar strategy of diversifying weapon acquisitions and partnerships as well as developing systems through indigenous industry. 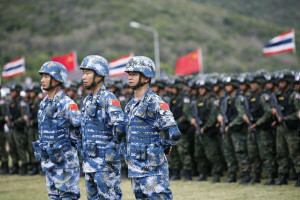 What used to be a military dominated by American hardware and military exercises, is transforming with the acquisition of Chinese tanks, European warplanes, Middle Eastern assault rifles, Russian helicopters, and Thai-made armored vehicles – as well as joint drills held with a variety of nations, including for the first time, China. A similar shift is occurring throughout the rest of Asia, with China naturally assuming a large share of regional cooperation due to its geographic, economic, and demographic size. 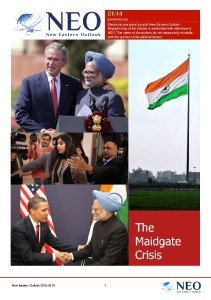 Asia’s transformation was entirely predictable, and despite the fact that the United States attempted to “contain” China and preserve its influence throughout the rest of Asia, it did so ignoring the fundamentals of economics and sociopolitical factors, and instead focused on coercion through “trade deals,” compromising military “alliances,” and the creation and perpetuation of artificial strategies of tension both within targeted nations and between Asian states. The United States, indifferent apparently to the factors that have led to its decline in Asia Pacific, has decided to double down on “soft power” gimmicks rather than examining and improving its economic fundamentals. This includes the use of programs aimed at co-opting cadres of “young leaders” in the region to promote US interests and attempt to reverse politically the gains Asia has made economically and geopolitically. It also includes a relentless propaganda campaign aimed at portraying nations throughout the region as capitulating to Beijing on a variety of issues that are transparently in the entire region’s best interests. The 12-hour detention of well-known Hong Kong democracy activist Joshua Wong at Suvarnabhumi airport has backfired on the military regime as criticism has poured in from local and international human rights activists over Thailand’s excessive accommodation of Beijing’s demands. The op-ed then enumerates several other recent deals made between Bangkok and Beijing, claiming they too were made strictly to accommodate Beijing. 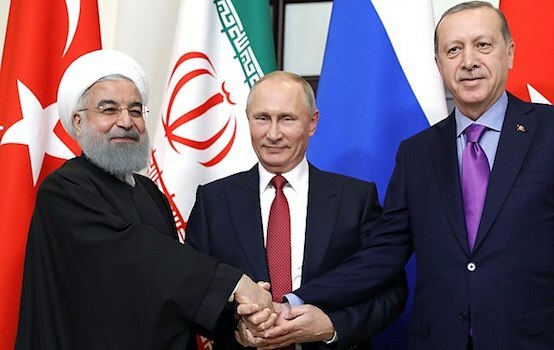 They include the deportation of suspected terrorists to China who were bound for Turkey and likely on their way to join international terrorist organizations operating in neighboring Syria. In reality, Joshua Wong was admittedly attempting to enter Thailand to help sow the same US-backed instability in Bangkok he led in Hong Kong. He was specifically meeting US-backed agitators in Bangkok who form one of several fronts attempting to seize back political power for parties backed by and tied to Washington. Thus, the move to deport Wong back to China was in both Beijing and Bangkok’s best interests. Likewise, the deportation of terror suspects to China benefited both nations as well. 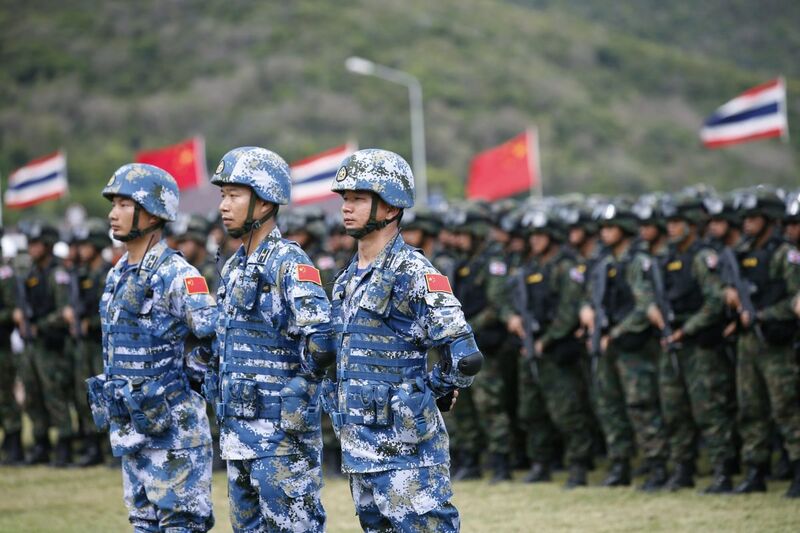 Had Thailand continued serving as a conduit for terrorists bound for Syria – and should Syria eventually collapse under pressure from US-armed terrorists – it will lead to global instability that will reverberate across all of Asia, affecting both China and Thailand. US attempts to destabilize China – the primary trading partner for nations across the entirety of Asia – is a direct threat to the entire region, not just Beijing. It is not “caving in” to Beijing to ensure stability prevails and that the US is unable to repeat the “success” of its efforts to stir up political instability in North Africa and the Middle which has led to region-wide war, the death or displacement of tens of millions, the socioeconomic collapse of entire nations, and the potential for wider and more direct war across several regions of the planet. A final irony the Bangkok Post omits amid its transparent propaganda is the fact that absent of China’s interests, Asia has for decades been made to “cave” to Washington’s every whim. It should be no surprise that a newspaper founded by a former US intelligence officer and funded by the US State Department would exhibit in its editorial pages the same sort of shameless exceptionalism that the US itself exhibits upon the international stage. However, it is a corrosive, counterproductive “exceptionalism” Asia has collectively decided to move on into the future without. The sooner Washington can recognize and accept this, the sooner it can rationally realign its relations with Asia toward something tangibly more constructive. While Washington will have to accept Asia as an independent and self-driven region as well as a significant competitor, it can decide whether that competition is healthy and constructive, or unfolds in an atmosphere of confrontation and perpetually impending war.